It’s as scary for mother as it is for the rest of the family. I remember how critically it was talked about in our town when I was young. “Hamara pota toh bade operation se paida huya hai, bahu ko thik hone mei bahut time lagega” – means our grandson is born through big operation and our daughter-in-law will take a long time to recover. It was considered as big operation and only happen in a critical health situation of would-be-mother. But now every mother I encounter relays to me that their baby was born through a cesarean section. On further research I glanced upon this report, which states that in the year 2012 the rate of c-section deliveries were as high as 50% in some states of India. Current rates are probably higher. 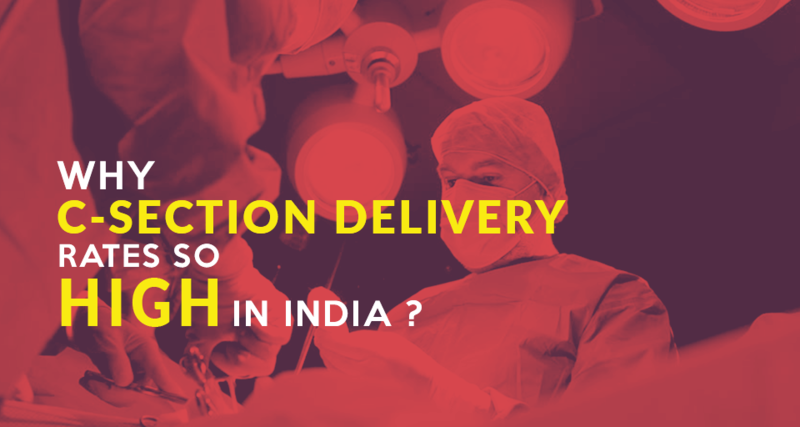 Who is responsible for the high rate of C-section deliveries in India? Before we start blaming doctors and medical professionals in India, let’s first take a look at ourselves. How much have we changed in our lifestyle. In the earlier times, women does a lot of physical work at home. Now all the physical work like cleaning, washing or grinding has either been outsourced to kaamwali bai or has been automated by machines. In the absence of physical work, people are getting overweight. In India, women are not replacing their physical activities with workout at the gym or through outdoor sports. According to obesity foundation india “In the Indian scenario, even with the growing awareness regarding health and fitness, more than 3 percent (3 crores ) of the Indian population are obese.” This is alarming, isn’t it? Our nation is becoming victim of obesity, diabetes and heart related diseases. This is something that can be addressed by a change in our lifestyle, which involves participating in more physical activities and eating fresh and nutritious food. Whether you believe on Rajiv Dixit or not, scientific fact is that women will more likely to have normal delivery if she continue to exercise and involve in physical activities especially related with the abdomen. In earlier days, women had lifestyle with intense physical work but it’s no longer the case. Let’s start our favorite blame game – “Doctors in India are not interested in vaginal delivery”. This might be true to some extent, every profession in India is looking for more profits and doctors make more money in Caesarean delivery than normal delivery. So, which clears the fact that all the doctors are not same. It’s your duty to find a good doctor who will ultimately look out for you and your baby’s overall well-being. There are doctors like Dr Ganesh Rakh, who waives off delivery charges for the birth of girl child, there are doctors like Pratibha Narayan and Rajiv Punjabi who charge flat fees for normal delivery and C-section. There are thousands of doctors like them who brought back our trust in doctors and the medical profession. Internet has made things easy, where you can ask people for advice even when you don’t know anyone personally. Sounds interesting? Download babygogo app, and ask your pregnancy related questions. 20,000+ mothers and doctors are willing to share their experience and advice free of cost. There are genuine health issues which lead to the C-section deliveries. WHO recommended 10% C-section delivery rate after surveying 137 countries. There can be complex issues like abruption of placenta, umbilical cord around the neck, pre eclampsia, failure to progress, or reduced transmission of infections. There could many other complications which may arise during your pregnancy and for that you may have to go for C-section delivery. But, it is neither good for the mother nor for the baby. Education about pregnancy and a healthy lifestyle is a good way to avoid increasing your chances of delivering via a cesarean section. If you have anything to discuss, write them in the comments below! If you wish to connect with 20,000+ mothers (or would-be-mother) like you, then install babygogo app on your android phone.